We certainly had our fair share of the April showers. And our hearts and prayers go out to those in the southern part of the U.S. who have experienced extreme weather and have lost homes and loved ones in the tornadoes over the last few days. If you haven’t already been out in the garden and flower beds, and some places have been too wet to even think about putting a shovel in the ground, you need to be making room in your schedule to hit the ground running (no pun intended) over the next week or so. Getting to the end of April means that some things should already be done and others should certainly be making it to the top of the “to do” list. Let’s look at some “garden remodeling” tasks that can be done to make your garden and flower beds the envy of the neighborhood. 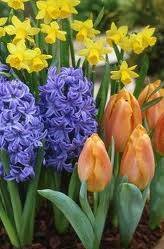 Your early Spring flowers are probably coming to an end and they need to be attended to. Dead heading and trimming plants off are house cleaning chores that help to make room for the new plantings. Turning the SoilIf you haven’t already done your tilling, it would be a good idea to take some time to turn over the soil and get the compost mixed in to the garden. This helps to aerate the soil as well as make the Spring planting easier. Transplanting any indoor starter plants should be done only after you are confident that the frost season is over and that the temperatures don’t fall much below 50 degrees. Then again, some of your more hearty vegetable plants (peas, spinach, lettuce, etc.) should already be in and growing quite nicely. Mulching After Plants Are In Mulching can be done before you get all your new plants in the ground, which makes installation a lot easier. But if you have bits of time to get the plants in here and there, it doesn’t hurt to go ahead and get them in when you can. It will just mean that you will just have to take a little more care working the mulch in and around the flowers and plants. If you are hesitant to dive head first into gardening, whether flowers or vegetables, because you never did it before, I would Professional Greenhouse suggest that you take a trip to the local greenhouse and speak to the professionals there to get helpful and area specific input as to your desired outcome. These folks are in the business because they love gardening, so they are more than happy to help you through the process. A little elbow grease now will pay great dividends of vibrant colors and tasty vegetables in the seasons to come.